Saturday night I joined a lovely group of teachers to run my first race in some five-ish years, making it my first race registered as my married name, Klein! It was actually my first time running at all since we moved to Arizona almost three years ago. We moved in the 100+ degree heat of the summer, which my spoiled California body just couldn't handle. Yes, I admit I was a spoiled runner. For five years I happily dashed through the cool coastal breezes and cliffs that overlooked the Pacific while attending undergrad and grad school in Santa Barbara. Sigh. Then the next four years, I ran through the woodsy Los Gatos trails, only slightly grumpy that there was no ocean. Upon moving to Arizona in the summer of '09, I said good-bye to running. I was deathly afraid of the stories where people would run and get into trouble in the desert heat. I promised myself I would start again when the weather cooled down, but it just never happened. Until now! I was so excited to join the fabulous teacher team doing the Firefly Run, which benefited the American Red Cross. The Firefly Run is a night race, starting at that beautiful time when the sun is just leaving the sky. 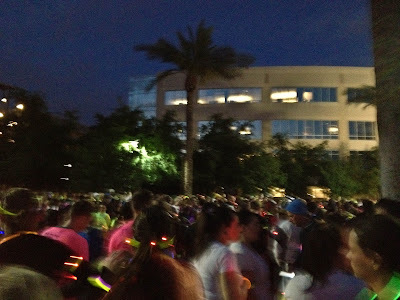 By mid-run, it's fully dark and everyone is illuminated with glow sticks and flashing bands. 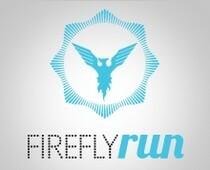 The Firefly Run is making its way around the country, so check to see if there's one coming near you. The San Jose run will be in September! We actually had a freak cold weather spell here for the race. All week long, I wore summer dresses to work, then once Saturday hit, it was freezing. Max insisted that I wear a puffy vest and ear warmers for the run : ) I did, thinking that I might be walking it, however I teamed up with one of the teachers who was running and just tried to keep up with her the whole time. It worked and I finished the 5k in 32:20 (10:24 minute/mile and quite toasty thanks to my gear). For my first time running in years, I'll take that! awesome time! I have never ran a marathon but I'm thinking of trying a race this coming Feb in Florida. Congrats on a great race! 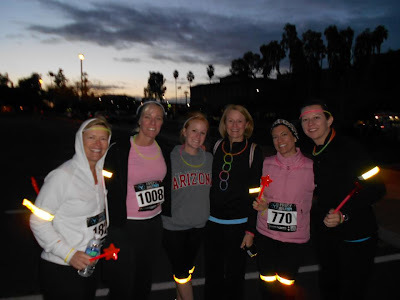 That's so fun that you got to run w/ some fellow teachers! I'm doing the same thing (except walking b/c of an injury) next weekend! Yay!